Pokerkaki is getting all set for the second installment of the Leisure World Poker Series folks, and we hope you are too. This month, in addition to the main event, the LWPS will be introducing the extremely popular Teams Event to the schedule, where you grab a partner and do battle against other pairs. What’s more, you’ll be enjoying the same $10 for 6 beverage promotion, courtesy of Corona Extra. Last but not least, read on for details on our special forthcoming $888 tournament entry giveaways! See you on board! 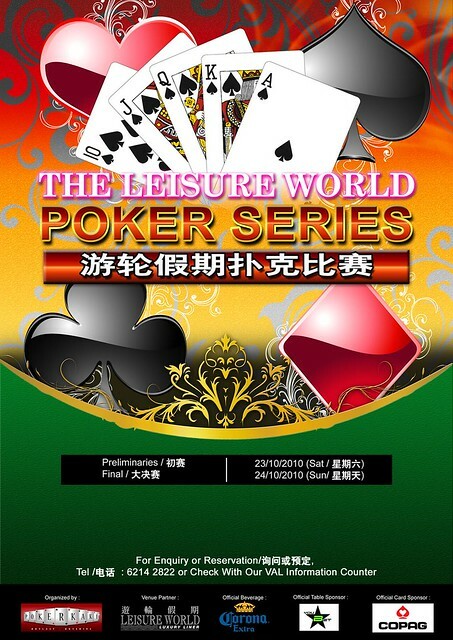 *The Champion and runner-up of the Main Event, as well as the winner of Side Event 2 will receive entry to the Leisure World Poker Series VI: Chinese New Year Bonanza Main Event in February 2011, worth SGD$888, in addition to the prize pool. That’s not all! The Leisure World Poker Series will also be giving away 3 seats to the $888 LWPS VI Main Event in February, in a lucky draw to be held an hour before that tournament commences All you need to do to qualify for the lucky draw is to have participated in at least 7 LWPS tournaments from LWPS I to LWPS V. Watch this space for more details in the coming months. Call the New Century Tours hotline @ 62142822 now to book your cruise tickets! The previous series, I am "forced" to paid $20 for the day extension. Is it possible to get this extension waived off if I join the tournament on Sunday? Yes we've been informed that the $20 extension charge will be waived hereon. *****Correction: We've just been advised that there are changes to the above. The $20 extension charge still applies. You can get a $40 rebate on your ferry ticket charge with a $300 NN chip purchase on board, and you can get a rebate on your $20 extension charge with an additional $300 purchase of NN chips. cabin still priced at $60? kklp wrote: cabin still priced at $60? Yes the cabins are still priced at $60. Leisure World is presently having a 1 for 1 promotion on their cabins, so you can pick up a room on Saturday for $60, and you can stay free on Sunday. If you choose not to stay on Sunday, you can still use your free night on your next trip (be sure to get your room voucher). The right to exercise your free night is valid for a 30 day period from date of voucher issuance. You can't however, exercise the free night on the eve of a public holiday. Note also that if you pay for the cabin on a weekday, you can only exercise the free night on another weekday, but if pay for a cabin on the weekend, you can exercise the free night on either a weekday or a weekend. Hi sir, main event 2 flights or 1? If 2 flights, can advise timings? yes there is an early bird 1 for 1 cabin promo. you need to book by 15th October to qualify for the promo. this means its only 1 flat flight to play and there will be at least 15 tables? that's right. 1 flight only, and there will be at least 15 tournament tables. UB u coming to Macau? i flying in with Ricky, Ivan and Champagne, maybe Minsoon on 30 Oct for Asian Poker King @ Starworld. I expect you to be there too, rite?